One of the main Hasbarah (Israeli propaganda) talking points is how the Arabs, for which read Palestinians, teach their children to hate whereas the Israelis teach their children love and peace to all. Above are 2 videos, which put this into context. One of the videos show Israel’s police teaching children how they ‘confirm the kill’ of a terrorist (who by definition is an Arab). Bearing in mind the recent conviction for manslaughter of Elor Azaria, [see Israeli Soldier and National Hero Elor Azaria Goes on Trial For Executing Palestinian Lying Prostrate] for shooting a wounded Palestinian in the head at point blank range, it is quite clear that Israel’s police and army follow a policy of murdering anyone who shows the slightest degree of resistance to Israel’s military and police repression. The other video and the article below show how Israeli children in an Orthodox Jewish school are taught to hate Arabs. It needs no commentary. Why are Israeli children brainwashed to hate? On a recent video, Israeli Prime Minister Netanyahu slammed both the new Hamas charter (which he ’threw in the bin’ at the end of the clip), as well as mainstream media for suggesting that the new document indicated ‘moderation’. He could also have read Fathi Nemer’s sober analysis here on Mondoweiss, which points out that the new document merely emphasizes politics that have been in a process of ‘moderation’ in the past decade anyway. “The Government of Israel flatly rejects the establishment of a Palestinian Arab state west of the Jordan river”. There is a particular religious educational program that is indoctrinating children to ‘long’ for a rebuilding of the ‘3rd temple’, instead of Al-Aqsa. It is called “Love of the Land and the Temple”. “The program follows one very clear ideological direction: that we need to quickly build the Temple so the Jewish people will be ‘the best’ in the world. That’s brainwashing, not education”. The following video, taken from Israeli television (I could not find the prime source), shows children at an Israeli Jewish Orthodox religious school, visited by two men who have come to ‘test’ their general knowledge. It deserves special scrutiny. The female teacher asks them what they think when she says ‘Jerusalem’. They answer sacred, temple, etc. She asks who believes the (3rd) temple will be built in the coming years – everyone raises their hands. “And what is there now?”, she asks. “The mosque, Al-Aqsa” they answer. “And what will happen to the mosque?” she asks. “It will be broken, exploded, disappear” they answer. (The teacher makes no response and continues on, as tacit approval). She asks who has met an ‘Arab’ boy in the past year. Many raise their hands. One of the visitors asks where. A boy says near the ‘Wall’ (‘Western Wall’). He is asked whether he talked with him, and the boy says no, that he just “pushed me”. The teacher hurries on: “And what happens when you see an Arab boy? What do you feel?” They answer “Anger”, “I want to kill him”. Teacher continues unabated: “And what happens when you meet a secular [Jewish] boy?” she asks. One boy answers “I pity him for not having been born Haredi (Orthodox Jewish)”. The teacher asks why, and another answers that it’s because “he doesn’t tread the right path”. The teacher asks what they see when they think of Jerusalem in 10 years’ time, and several answer. A little debate ensues between those who say all will be Haredim and those who say all will be Jews but not necessarily Haredim. One boy then answers that all will be Jewish, but there will also be some Arabs who will be slaves. The teacher picks it up – “because the Messiah will come! I get it!”. Another student opines, that “there will be a war, and all Arabs will die, and some of them will be slaves”. The visitor who seems to be the main supervising authority, is very pleased, he says to the teacher “there it is, you got the whole story”. He thanks the students and wishes them continued success and continued study “here in the Yeshivas”. But religious fundamentalist, fanatic and violent indoctrination is not the only brainwashing going on in Israel. There is also the purely military violence. 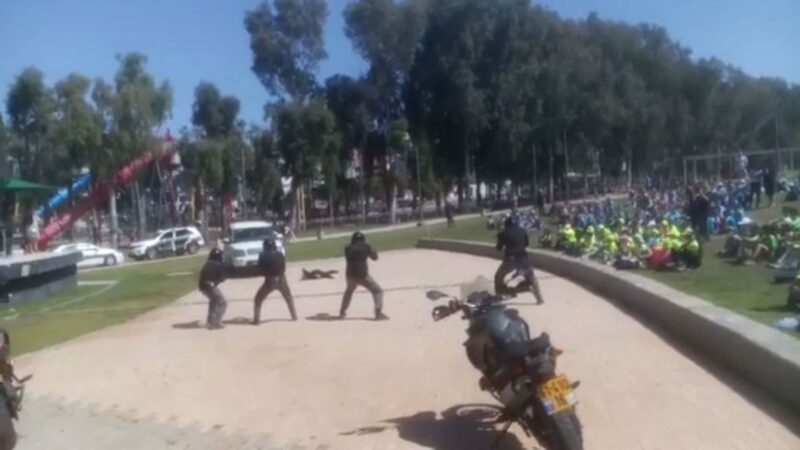 Two days ago, the Israeli police did a demonstration in Ramat Hasharon for hundreds of 5th-graders, in how they ‘verify a kill’ of a suspected ‘terrorist’. The mock-operation using blanks, featured policemen coming on motorcycles and riddling a terrorist with countless rounds, continuing to shoot at him long after he has fallen and is motionless – to ‘confirm the kill’. This is a mock-theatre of an extra-judicial execution, with outrageously excessive violence. And we are not speaking about security forces ‘in the heat of battle’, as it were. They are performing a carefully tailored, and staged, operation. One must thus be in the conviction that they are demonstrating HOW IT IS DONE. Some parents were upset with this demonstration of violence, whilst the police spokeswoman could not understand the issue: “The children clapped, they were happy”, she said. Bingo. Azarya was no aberration – he just got caught on film. And now the Israeli police also spilled the beans, in front of cameras and hundreds of children. It’s good we have Hamas, to always blame the violence upon. The following video, taken from Israeli television (I could not find the prime source), shows children at an Israeli Jewish Orthodox religious school, visited by two men who have come to ‘test’ their general knowledge. It deserves special scrutiny. The female teacher asks them what they think when she says ‘Jerusalem’. They answer sacred, temple, etc. She asks who believes the (3rd) temple will be built in the coming years – everyone raises their hands. “And what is there now?”, she asks. “The mosque, Al-Aqsa” they answer. “And what will happen to the mosque?” she asks. “It will be broken, exploded, disappear” they answer. (The teacher makes no response and continues on, as tacit approval). She asks who has met an ‘Arab’ boy in the past year. Many raise their hands. One of the visitors asks where. A boy says near the ‘Wall’ (‘Western Wall’). He is asked whether he talked with him, and the boy says no, that he just “pushed me”. The teacher hurries on: “And what happens when you see an Arab boy? What do you feel?” They answer “Anger”, “I want to kill him”. Teacher continues unabated: “And what happens when you meet a secular [Jewish] boy?” she asks. One boy answers “I pity him for not having been born Haredi (Orthodox Jewish)”. The teacher asks why, and another answers that it’s because “he doesn’t tread the right path”. The teacher asks what they see when they think of Jerusalem in 10 years’ time, and several answer. A little debate ensues between those who say all will be Haredim and those who say all will be Jews but not necessarily Haredim. One boy then answers that all will be Jewish, but there will also be some Arabs who will be slaves. The teacher picks it up – “because the Messiah will come! I get it!”. Another student opines, that “there will be a war, and all Arabs will die, and some of them will be slaves”.